Some people believe in the power of prayer to heal them. Others trust modern medicine. Why not combine the best of both worlds with the Jesus Pill Box? 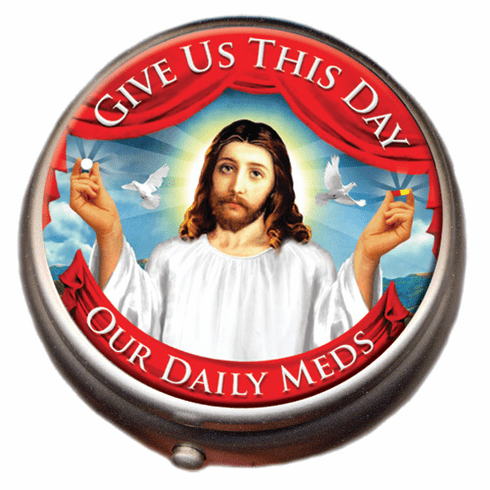 This attractive, high-chrome pillbox features an inspiring image of Jesus holding out pills in his outstretched hands. The words "Give Us This Day Our Daily Meds" wrap around him. The interior of the pillbox is divided into sections, but the divider can be removed if you want one large compartment or are a Unitarian. The Jesus Pill Box comes in a very attractive gift box and would make either a touching or amusing gift, depending on how you look at it. Pillbox has 2 compartments. 2" in diameter and 5/8" thick.